The first of two interesting plays we're going to highlight this weekend occurred in Colorado. Though a batter is permitted to ask for "Time" prior to delivery, once the pitcher starts his windup or comes to a Set Position, the plate umpire shall not grant the request: This is the gist of Rule 5.04(b)(2) Comment as it pertains to the batter's box allowance during a pitch. Rule 5.04(b)(2) prescribes the penalty for such a violation: "If the pitcher pitches, the umpire shall call 'Ball' or 'Strike,' as the case may be." D'Backs Manager Torey Lovullo talks balks. That said, it's of equal importance to know what to do if the pitcher stops his delivery or otherwise appears to balk as a result of the batter's illegal action in requesting "Time" or backing out of the box after the windup has commenced or Set Position has been achieved. Rule 5.04(b)(2) Comment describes this result, as well: "If after the pitcher starts his windup or comes to a 'set position' with a runner on, he does not go through with his pitch because the batter has inadvertently caused the pitcher to interrupt his delivery, it shall not be called a balk. Both the pitcher and batter have violated a rule and the umpire shall call time and both the batter and pitcher start over from 'scratch.'" Related Post: Starting From Scratch - Batter Disrupts Pitcher's Delivery (6/29/16). Furthermore, in the Minor Leagues, Rule 5.04(b)(2) Comment states that if the batter backs out of the box after the pitcher starts his windup or comes set, it should be deemed a violation of the batter's box rule and a warning issued (if it's the batter's first violation of the game). If it's the batter's second or any subsequent batter's box violation, the ball shall be declared dead and a strike shall be awarded. Case in Point: In the 2nd inning of Colorado's eventual 19-2 victory over Arizona, with a runner on first, Rockies batter Tony Wolters requested "Time" from HP Umpire Chad Whitson after Diamondbacks pitcher Jorge De La Rosa had come set and was mid-delivery. 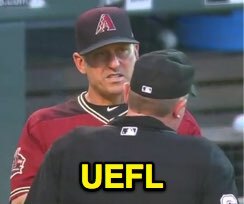 Seeing that Wolters was no longer in a hitting stance (and no longer looking at the pitch), De La Rosa terminated his delivery, resulting in a balk call as Diamondbacks skipper Torey Lovullo contested the ruling. Analysis: There is only one reason a start-stop balk would be appropriate here and that would be if the umpire deemed that the pitcher terminated his delivery on his own, without any input from and independent of the batter's actions. If the umpire believes the pitcher was, in any way, influenced by the batter so as to cause interruption or premature termination to his delivery, then the proper ruling is a "start over from scratch" declaration. Mechanics/Responsibility: As this is a balk call—the "shared responsibility" call amongst the crew—had any other umpire seen the batter's actions and deemed he caused the pitcher to interrupt his delivery, crew consultation could be effected. Realistically, there's a greater chance the corner umpires at first and third base were locked into the pitcher and, depending on the second base umpire's positioning, he might not have had a look at the batter, either. Changing the Play: Let's say that the HP umpire did call time or knows that batter stepped back and caused the pitcher to stop and one of our base umpires, focused on the pitcher called the balk. Then it is the responsibility of our plate umpire to loudly and emphatically step up (while signaling time) and say something to the effect of, "I have time, batter asked for time." I'm not a big fan of yelling out-- "Batter can't cause a balk." That will just open a can of worms. One thing is for certain: When you reverse a balk the offended manager will be saying hello. That is when you can say, "By rule the offensive team can not cause a balk and the batter asked for time causing the pitcher to stop the delivery of the pitch."